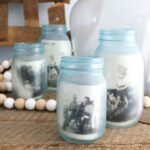 Add farmhouse style antique jars to your home in minutes with just some plain jars and a little paint. Mix the marbling medium with the frosted glass paint. I mixed it 2 parts marbling medium to 1 part paint. The instructions on the bottle say to mix 1 to 1 but I wanted a more transparent look to the jars so I used less paint. Stir well inside of a disposable cup with a craft stick. Then start dripping on your jars and turning them as you go. Drip all three colors on the jars randomly. Keep turning and allowing the paint to marble until the entire jar is covered. You can also use the craft stick to help spread the paint to cover all areas. Then turn the jar upside down on top of a disposable cup. Repeat for all jars then allow to dry overnight. Remove the dry jars from the cups and clean up the excess dried paint from the tops if needed. Add your photo and display your frosted mason jar photo frame anywhere around your home. This project for Frosted Mason Jar Picture Frame was printed from CraftsbyAmanda.com - https://craftsbyamanda.com/mason-jar-photo-frames/ and can only be printed for education or personal use.